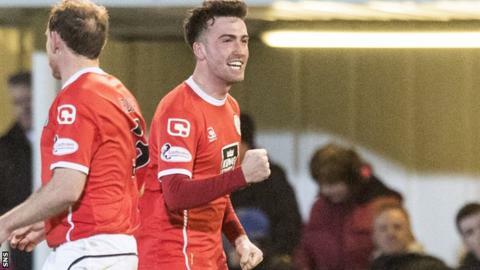 St Mirren hammered Renfrewshire rivals Morton at Cappielow to move up to eighth in the Championship. Stelios Demetriou, Stevie Mallan, John Sutton and Gary MacKenzie all scored to make it four wins from their last five league games for the Buddies. Andy Murdoch had levelled for the hosts but it was a rare moment of joy for Morton, without a win in five games. St Mirren are now one point ahead of Raith Rovers, who they have still to play in the run-in. Morton looked nervy early on and manager Jim Duffy berated his players for being too hesitant in defence, something which led to Demetriou's opener. Similar to his double against Hibernian, the Cypriot cut in from the left and fired low into the corner with his right foot in front of the travelling, uncovered fans to give them reason to cheer in the wind and rain. A fine Ton move got the hosts back in it before the break, with Michael Doyle crossing for Murdoch to side foot home. But the Paisley men reasserted themselves immediately after half-time in brilliant fashion - Mallan finding the bottom right hand corner from the edge of the box in typically impressive fashion. Two became three when Rory Loy's low centre was converted by Sutton in what was his 100th start for the Buddies. And defender MacKenzie put the icing on the cake with a downward header from Mallan's excellent delivery. With four games remaining, Morton drop to fourth in the table but have an eight-point cushion on Queen of the South to protect their play-off prospects. In-form St Mirren have to play the top three sides as well as Rovers in their battle for safety. Match ends, Morton 1, St. Mirren 4. Second Half ends, Morton 1, St. Mirren 4. Andy Murdoch (Morton) wins a free kick in the attacking half. Foul by Josh Todd (St. Mirren). Foul by Luke Donnelly (Morton). Substitution, St. Mirren. Rocco Quinn replaces Stephen Mallan. Substitution, Morton. Luke Donnelly replaces Lawrence Shankland. Substitution, St. Mirren. Josh Todd replaces Cameron Smith. Lawrence Shankland (Morton) is shown the yellow card for a bad foul. Foul by Lawrence Shankland (Morton). Substitution, St. Mirren. Craig Storie replaces Rory Loy. Goal! Morton 1, St. Mirren 4. Gary Mackenzie (St. Mirren) header from the centre of the box to the centre of the goal. Assisted by Stephen Mallan with a cross. Attempt missed. Ross Forbes (Morton) left footed shot from outside the box is high and wide to the right from a direct free kick. Substitution, Morton. Michael Tidser replaces Jamie Lindsay. Jack Baird (St. Mirren) is shown the yellow card. Attempt saved. Stephen McGinn (St. Mirren) left footed shot from outside the box is saved in the bottom left corner. Michael Doyle (Morton) is shown the yellow card. Corner, Morton. Conceded by Jack Baird. Aidan Nesbitt (Morton) wins a free kick in the defensive half. Foul by Jamie Lindsay (Morton). Attempt saved. Gary Oliver (Morton) header from the centre of the box is saved in the bottom right corner. Goal! Morton 1, St. Mirren 3. John Sutton (St. Mirren) right footed shot from the centre of the box to the centre of the goal. Assisted by Rory Loy. Attempt blocked. Andy Murdoch (Morton) right footed shot from the centre of the box is blocked.